There are four habits you can keep in the bathroom that will make cleaning the bathroom much easier. If you can train your children in these habits, it will make their chores easier, too. 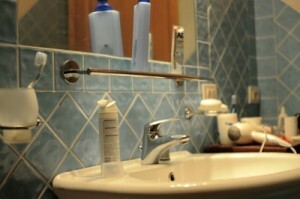 Wipe the vanity/counter top with a towel after each use to keep it clean. This means keeping a small towel such as a hand towel within reach of the sink to make it easy. Rinse out the sink after each use so everything rinses down the drain. Spray the walls of the shower after each use with the shower cleaners designed for that. They come in a hand-held spray bottle or a dispenser that hangs on the shower head. This really wards off the mildew and makes it so much easier to clean. Swish the toilet periodically—with or without cleaner. This helps clean the walls of the toilet and prevents buildup of a ring around the water line.